After much anticipation, Regency Centers' latest development Mellody Farm, in suburban Chicago, opened to the public October 7. On the chilly fall day hundreds of eager Vernon Hills residents and their families turned out to explore their new 268,200 SF shopping district. Shoppers received their introduction to the center's five anchor store openings — Barnes & Noble, HomeGoods, Nordstrom Rack, REI Co-Op and Whole Foods Market. 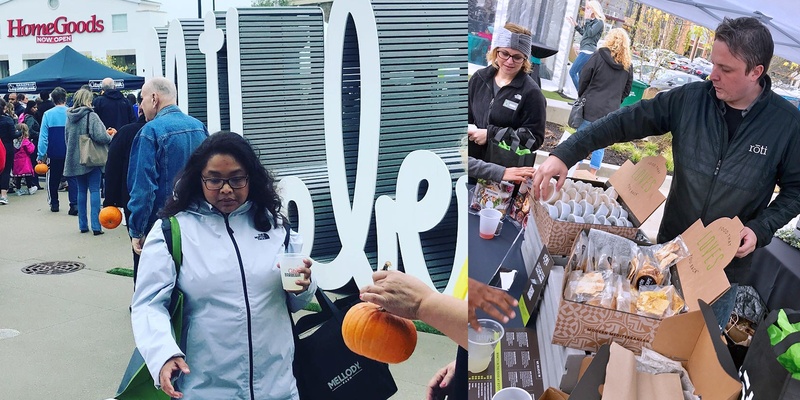 Kids of all ages enjoyed caricature artists, face painting, balloon twisters, and a Whole Foods Market-sponsored miniature pumpkin decorating station. Some of Mellody Farm's soon-to-open eateries — B. Good, Roti Modern Mediterranean, and City Barbeque — showcased their food offerings. 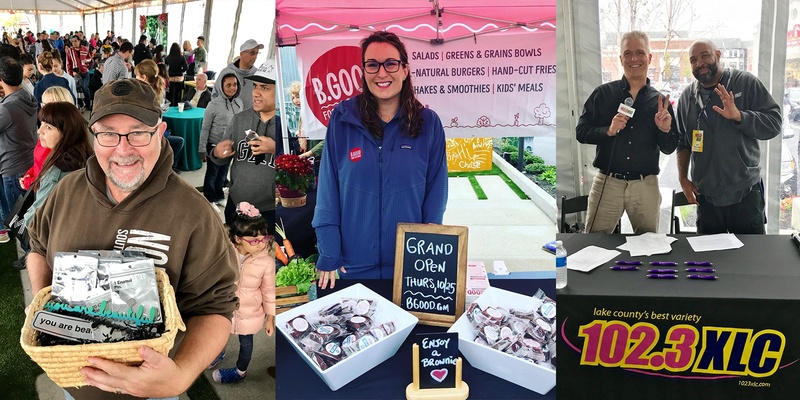 A group of energetic girls from Dance Center North dazzled on stage while nearby personalities from local radio played popular songs and announced hourly giveaway drawings to Mellody Farm merchants and eateries. It was incredibly gratifying to see all of the hard work that the Regency Centers team put into the opening event over the last few months come to fruition,” said Matt Hendy, Regency Centers Vice President of Investments. “It was even more special to see the community embrace it. That really speaks to how impactful a project like this can be. Art also takes center stage at Mellody Farm. 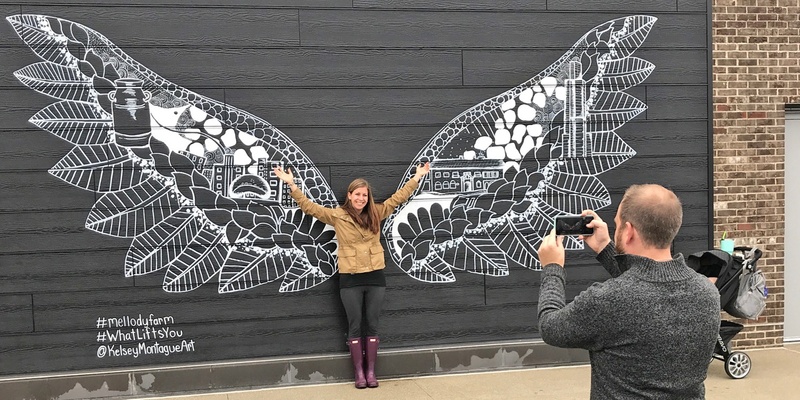 From a sprawling 'all the best' oversized sculpture and black-and-white 'smile' mural both created by local artist Matthew Hoffman to Kelsey Montague's Instagram-worthy #whatliftsyou wings mural, shoppers snapped photos and posted to their social media utilizing a #mellodyfarm hashtag. Hoffman offered up his signature 'you are beautiful' and 'smile' merchandise at a pop-up table at the event. 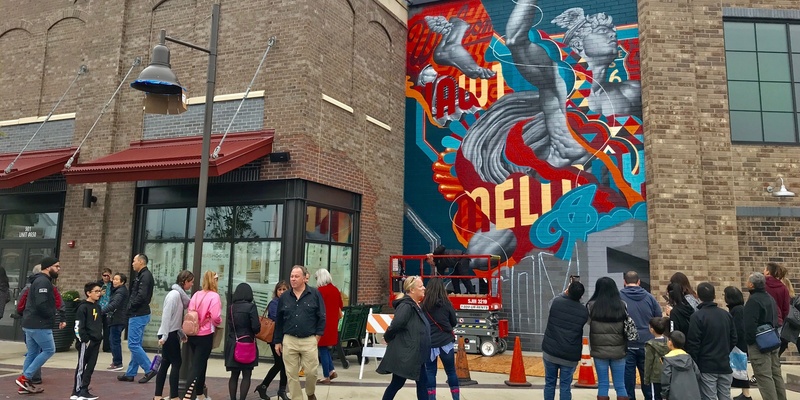 Across from the event tent was global street artist, Tristan Eaton, who was hard at work on a colorful mural between Nordstrom Rack and Barnes & Noble. Passersby stopped to take photos and admire the art — created only with spray paint. The remainder of merchants and eateries will open in the coming weeks and months. 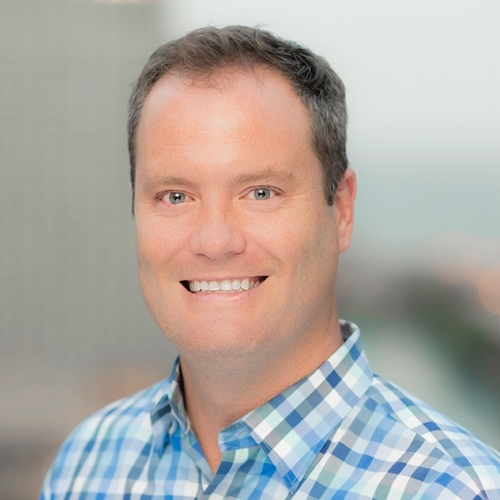 To read the full Chicago Tribune article, click here. To follow Mellody Farm on social media: Instagram and Facebook.